Pinnacle Black Label Diamond Wheel Coating blankets your wheels in a rock-hard barrier of protection that is impenetrable by ferrous brake-dust particles, road salt, tar or oil. Designed with brake-dust laden sports cars in mind, Diamond Wheel Coating and the layer of protection it creates makes laborious wheel cleaning a thing of the past. The super slick surface virtually eliminates brake-dust build up. Spray and wipe application lasts up to 18 months! Protects wheels for up to 18 months! Works great on brake calipers too! Black Label Diamond Wheel Coating is a nano-glass ceramic coating that was designed specifically for application on wheels. Formulated to withstand the extreme temperatures that wheels are exposed to, Diamond Wheel Coating shields your wheels against the damaging effects of ferrous (iron containing) brake-dust particles. A single 4 ounce bottle is enough to coat up to 100 wheels! Wheels that are coated with Black Label Diamond Wheel Coating will be easier to clean and maintain. Regular wheel cleaning will only require soap and water, even on brake-dust laden German sports sedans. Diamond Wheel Coating creates such a slick barrier of protection that most dirt and grime will be removed when driving through the rain. A strong jet of water from the hose will also knock off most of the built up brake dust, minimizing the amount of scrubbing required. Black Label Diamond Wheel Coating is safe and effective to use on all types of wheels. 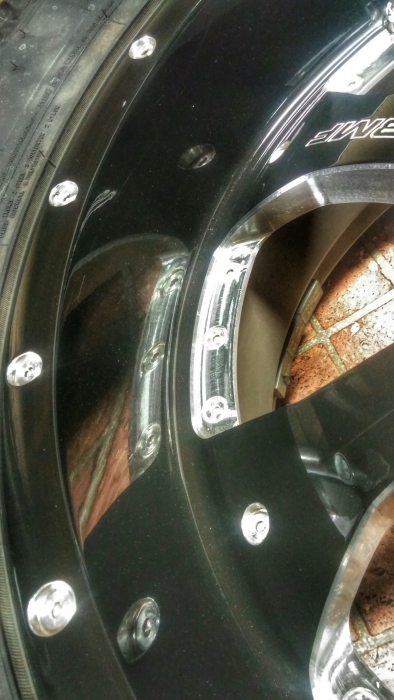 Use Diamond Wheel Coating on painted, clear coated, polished, anodized, chrome, and bare aluminum finishes. Spray and wipe application only takes minutes to apply, and the glossy layer of protection lasts up to 18 months. Black Label Diamond Wheel Coating should only be applied to wheels that have first been polished with Black Label Surface Cleansing Polish. This step is crucial as it removes contaminants, oils, and fillers that would otherwise prevent the coating from bonding. Once that is completed, application of Diamond Wheel Coating is as simple as spraying on and evenly distributing with a foam applicator. Ensure surface is cool to the touch and out of direct sunlight. Thoroughly clean each wheel first using Pinnacle Clear Coat Safe Wheel Cleaner. Polish wheels with Black Label Surface Cleansing Polish. Spray Diamond Wheel Coating directly onto a Gold Wax Finger Pocket and evenly distribute over the wheel. Work the coating into the surface until it disappears. Lightly buff with a clean, soft, lint-free microfiber towel. It's been a couple of weeks since I applied the coat on two of my vehicles and I must say they look clean all the time. The gloss is just right on my black rims. First review for 2019!!! It's been about a week since I applied this product. Ease of use is great. Really couldn't be any easier. Simply wipe on and off. We've been getting heavy rain here since I applied the product and the wheels keep nice and clean. The verdict is still out on how long the product lasts. Used this on several Porscheâ€™s which have a lot of brake dust. After applying two layers as suggested, following wash the brake dust just rinsed off. Saved lots of wheel cleaning time. The shine is great as well. Easy to apply. I purchased this shortly after buying some nice machined wheels for my truck, which I wanted to run year-round (i live in the rust belt). My main concern was road salt. I cleaned the rims and applied as directed, the rims feel like they had a coat of wax on them with this coating. I wouldn't go as far as saying you can just rinse the grime off with a hose, but the rims require minimal effort to wash them, and feel just as waxed. I'll reapply every year. Excellent product! ConsA little pricey, but so were your wheels! LOVE LOVE LOVE this run coating. Makes cleaning rims super simple. They are slick like Crisco oil and the shine is terrific. Worth every penny. My customers love this product and are willing to pay a premium for it.